Behind the Bit: Where did all the sheepskin cribbing collars go? Where did all the sheepskin cribbing collars go? Riley's cribbing habit generally it has not been a big deal for me, but for his sake I wish he didn't. He doesn't react when I put it on, so maybe it doesn't bother him. Even so, I've always bought thick sheepskin covers for his collar. They really don't wash well -- no matter what I do they get shrunken and stiff -- so I buy new ones probably every six months. 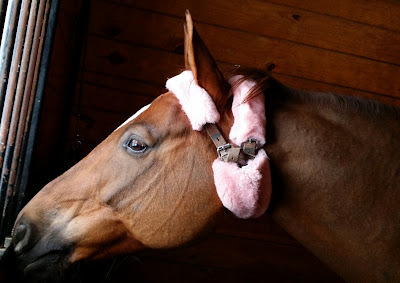 Last time around I got these custom pink ones, because I could not find manufactured sheepskin strap covers anywhere else -- not at Horseman's Outlet (for you New Jersey-ites) or online. I finally found some online at FarmHouse Tack -- ECP brand cribbing sheepskins -- but my order at FarmHouseTack.com came back permanently out of stock. The store owner was so nice! She found another brand (Fleeceworks) and ordered them for me. I have to wonder why these are becoming so hard to find. Those of you who own cribbers, what are you doing? When I had Pepper, I used to sew my own from faux fur. They were super-simple to make since, as you noted, they're basically just furry tubes! You might see if you can buy some sheepskin and take them to a local leather shop with the measurements you want - probably you can get several covers made inexpensively at one go.